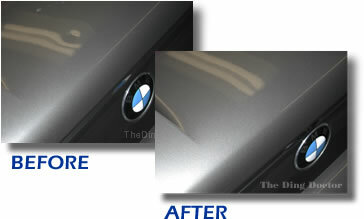 The Ding Doctor San Diego's Leader in Paintless Dent Removal. Satisfaction Guaranteed! Since 1998 in San Diego, CA. The Ding Doctor can repair everything from door dings and small dents to minor fender benders-as long as the paint has not been cracked and the metal is not stretched or crimped. SAVE extra 10% by sending photos to email or text. Our primary service is the removal of minor dents & dings through the process of Paintless Dent Removal (PDR). We also offer minor paint touch-up, minor surface scratch and scuff polishing and windshield chip repair on a limited basis with any qualifying dent removal. It is this wealth of experience and our passionate desire to be the best craftsmen in our field while providing the best customer service possible that set us apart. We welcome the opportunity to earn your trust while showing you what we do best, should you have the need. The Ding Doctor has been exceeding customers' expectations in San Diego since 1998 and we have been perfecting the dent removal process since 1985. The Ding Doctor a is locally owned and operated family business.